Will has been staying with us as he looks for an apartment, which he has indeed found – near his job at Merrimack College in Andover, MA. Throughout the summer we’ve played golf twice weekly before he heads off to work. In the time he’s been staying with us, he’s the one cutting the lawn, siding and roofing our shed, and been the “go to” guy when something heavy needs to be lifted (e.g., just the other day he brought in the winter storm doors from said shed.). Molly lives in Virginia and has been here the last week with her son Owen. 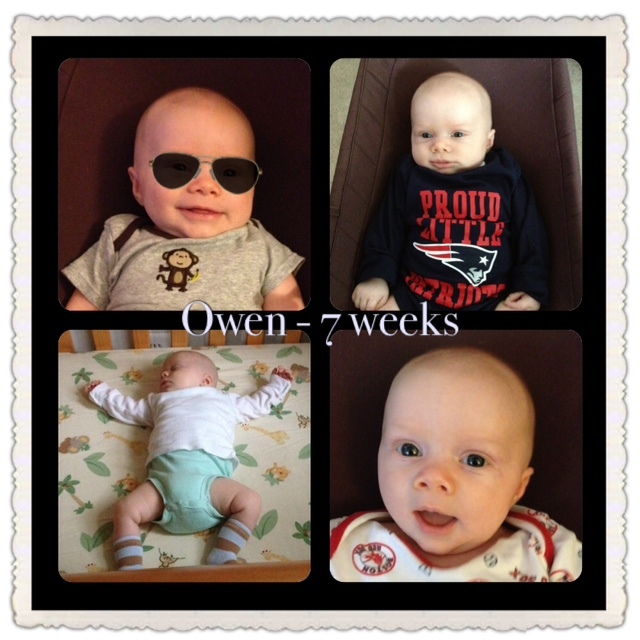 With a two month old baby, Molly’s comings and goings revolve around Owen’s schedule. Walks, evening wine and conversation, and also some golf highlight our days with Molly. So today I think of our daughter Robyn. Living on her own in Syracuse, NY, Robyn is a successful craftswoman (candles, mittens, hats) at local fairs and online, as well as a caregiver. We’ll get to see her at a wedding next month, but it’s mostly holidays and family gatherings when we get together. Today my gift is an afternoon call hoping to catch her in, which I do. I put her on speaker phone and Hannah and I get to check in and see how she’s doing. Upbeat and dear, Robyn is a friend everyone would like to have. She is positive and hopeful. Being all that is a gift she gives herself and us. Two months ago Hannah fractured her left tibia water skiing. For the last three weeks I’ve been giving her therapeutic massage to augment her healing. For 25 some minutes twice a day with my hands lubricated with baby oil, I push the skin from her toes to above her ankle getting the blood and bodily fluids to migrate north. She zones out and I get to help heal the woman of my dreams. My gift? I don’t wait for Hannah to have to ask me when I’ll massage her leg. I check in first. Together we figure out what time works. The massage is a twice daily gift. Never having to ask is priceless. Starting my fourth week of 29 Days of Giving, I’m learning that the gifts don’t have to be dramatic and earth shaking. One doesn’t need to feed a starving Somalian child, though that would be a very good thing and, indeed, a four star gift. But four star gifts come in small packages too. They can be simple kindnesses. 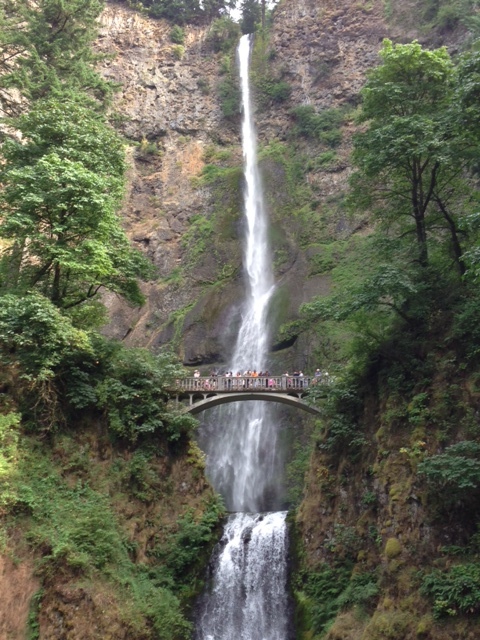 When Hannah’s brother Doug fretted about the sorry state of the world, especially environmentally, Hannah shared his concern but made her mark by making a difference in the life of one person at a time. She’d call, set up time together, or write a note showing her interest and compassion. 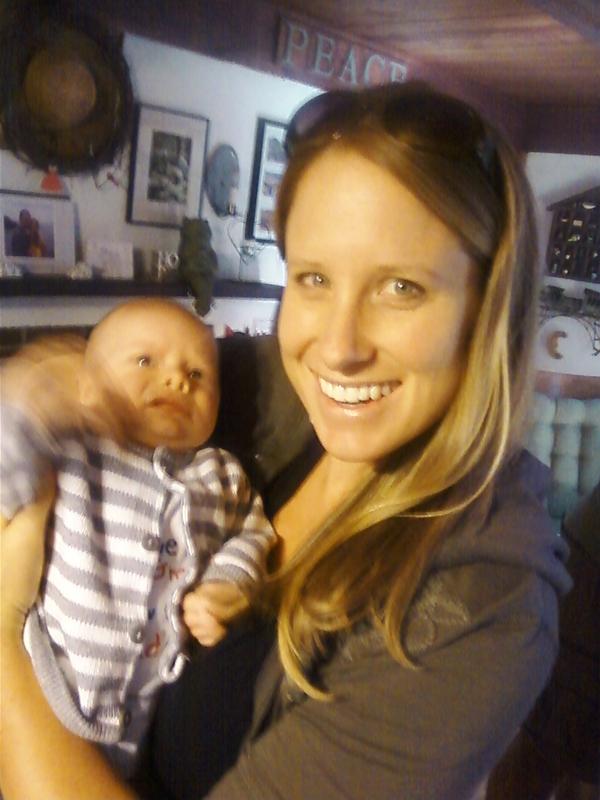 Today my gift is taking Owen in the early evening and burping him after Molly finishes breast feeding. With no altruism (please, there’s nothing better than cradling our grandson to my chest, patting him on the back, listening to him gurgle, and watching him bob his head as he checks out his world), I give Molly a short break. When our three kids were preschoolers, there was no greater gift for Hannah and for me than when someone would babysit for us. As young parents, Hannah and I would have a regular Saturday morning breakfast date, often at Bill Johnson’s Big Apple in Phoenix, AZ. Throughout the week, we could look forward to our date; especially knowing we’d be awake and fresh enough to have a real conversation. Usually we were so tired by evenings, we couldn’t put two coherent sentences together. So my/our gift tonight is babysitting Owen while his mom, Molly, and our son Will go out to dinner. As she leaves, Molly says, Call if you need to. We nod, but there is no way in God’s good green earth that we are going to interrupt their dinner. We are parenting veterans. 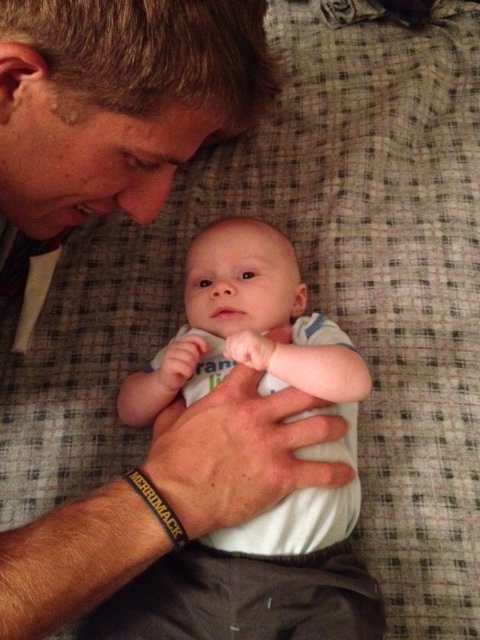 We can handle an eight week old, be he content or be he crying as if he will never stop. Tonight Owen lies napping in his Baby Bjorn Bouncer at our feet while we watch our movie, I Bought a Zoo. When he begins to wind himself up with blood curdling screams channeling his inner banshee (In Irish mythology, a banshee is a fairy woman who begins to wail if someone is about to die. ), I offer my second gift of the day. This one is for Hannah. As she finishes the movie, I go to the far reaches of our house to soothe a disconsolate Owen. As he wails, he has no idea how relentless I can be. I’m not giving up; I just coo, Owen you’ll be okay. Papa’s here. As we stroll around the house, he arches his back and kicks his feet to his wailing symphony. Trying to break his crying cycle, I lay him on the bed. That doesn’t work, so I continue to rock him gently around the house. Little does he know that he is no match for me tonight even when he scrunches up his face making it as red as the clichéd beet. I am on a mission for Molly and for Hannah tonight. Fortunately after a while, I again lay him on the bed and rock him side to side, which soothes and calms him. When his mother arrives home, it will not be to a screaming Owen. I’ve found it can be easier being the one holding the cards, treating others, sharing my bounty. It’s also seductive. The appreciation flows. Unavoidably there is some control; then liking being in control can follow. Too much “giving without sharing” can erode relationships. Let me explain. Twice a week during the summer, our son Will and I get up at 5A to play nine holes of golf before he heads off to work in the athletic department at Merrimack College in North Andover, MA. Golf is a game I began playing during the summers in Arizona. In Arizona, my teaching buddies and I could play 18 holes at 3P for two dollars! True it was the 1970s and true it was 105 plus degrees at that time of day, but it never seemed so hot being on the green fairways. Friendship with a grown child is a treasured gift that needs tending. As we play, Will and I talk about our shots. Though he outdrives me by a ton, we celebrate each other’s good shots. We don’t compete with each other; we just try to hit good golf shots within our physical and age limits. It’s very cool for me. My gift today is paying for our rounds of golf at Sagamore Hampton Country Club this morning. Later at nearby Betty’s Kitchen, Will pays for our breakfast of eggs over easy, home fries, and multi-grain toast (he has sausage patties, too). Sharing the gift of giving builds relationships. This email arrived a few days ago. Yesterday, in Church, we heard the scripture that “God loves a cheerful (hilarios!) giver,” and that when we give in this way the ripple effect “overflows through many thanksgivings to God.” I spoke of how I was influenced by the ripple effect which came my way through an e-mail/blog from a long time dear friend, Dan Rothermel. It was brought to my attention that we will be finishing the 29 days about the time we have our Parish Retreat in Pecos. So, let me encourage you to also keep a journal of your experiences of this experiment in giving, and on our retreat we will have time to tell our stories. I’m sure we will have some “hilarious” and heartfelt moments to share, since God has promised to join us in this adventure. May it be blessed! I knew Father John when he was Ralph, my teaching buddy at Nevitt Elementary School in Phoenix, Arizona in the 1970s. Now a priest in the Greek Orthodox Church in Santa Fe, New Mexico, he was the one who drove a Ryder truck with me cross country when we moved from Arizona to New England in the dead of winter in 1982. Three years later I drove a moving truck of his family’s belongings with him as he moved to Virginia to start seminary. Ralph has thrown a small stone into a now rippling pond. While Hannah takes care of our grandson Owen at our home, Molly and I go off to the local driving range to hit golf balls. Molly is a gifted athlete, who played three high school sports (soccer, basketball, and track) and a few years back ran the Boston Marathon. That said, as anyone who plays golf knows, golf is not a sport that those naturally athletic always pick up simply and easily. It takes practice. She and I practice together, today at the driving range; tomorrow we’ll play nine holes. Oh, there is more we have in common. Molly is a first child as am I. (By the way, Hannah is #5 of 7). Molly was our pilot program as we learned first hand about parenting. As parents we grappled with how long to let her cry in her crib before getting her. We wondered if four was too early to learn to ride a bicycle. We weighed what was a reasonable curfew when she dated in high school. As she will find with their son Owen, parents are doing the best they can, especially when as clueless as many of us are dealing with child numero uno. Today my gift is paying for a couple of buckets of golf balls to hit at Cape Neddick Country Club driving range. We pause between shots to talk about shots; celebrate good ones, wonder how we can hit others so badly. Later we chip balls and then have a putting contest for bragging rights. She hits with a natural, easy swing. Given time, she will be an excellent golfer. Time together is our gift to each other. While Hannah is on crutches and can’t drive, Mondays have become my grocery shopping days at Demoula’s Market Basket in Portsmouth, NH. My Monday routine often is that I’ll change the message board at church (e.g., Fill the Van Sunday for the York Food Pantry), go to Coastal Fitness to work out, then head to Demoula’s. We have elderly neighbors who can’t always get out. Today I stop by our neighbors and ask if they need anything at Demoula’s. Happily for me, they say yes. Coffee and aspirin would be great. Their bill comes to a grand total of $5.48. A mere five bucks and change. I’d love to just pay for it for them. And then it becomes clear what my gift will be. Rather than pay for them, I will let them pay for their two items when I return with their goods. What? Yeah, let them pay. If I pay, I may put them in an awkward position. And they may never ask me again. If that happens, we both lose. I want to keep the giving door open. Sometimes the gift is letting someone else pay their own way. Today’s gift is opening our home to our friends and neighbors so they can meet our grandson Owen, daughter Molly, and her husband Tip on this Saturday afternoon from three to five. It is not lost on Hannah and me how fortunate we are to have a home at all. 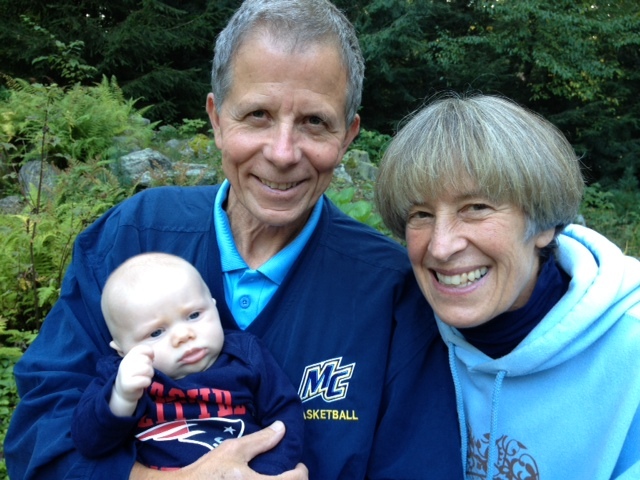 Returning to New England for a visit for the first time since our nearly two month old grandson Owen was born in Virginia, Molly and Tip are gracious and engaging to many people they have never met before. 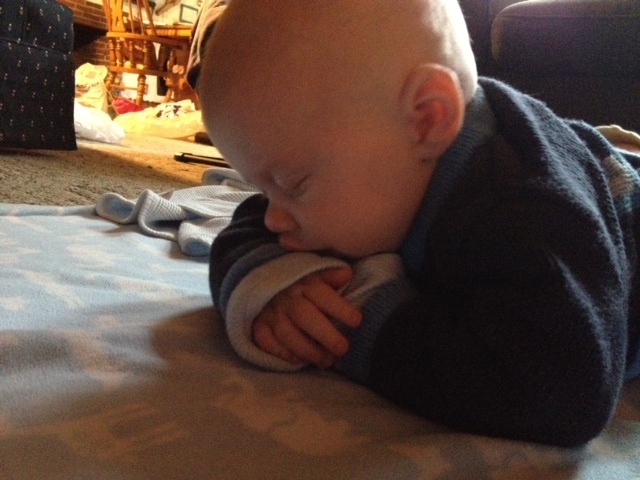 Owen’s sleeping up to seven hours at night. Every now and then he reestablishes control and wakes every two hours. Gatherings are just what we do. It’s like some are naturally good in math. Others hit a golf ball sweetly the first time they play. Others teach so that you would want your own children to have them as teachers. It’s just how they are hardwired. Such folks don’t need to be applauded or given trophies for what comes naturally. They know it’s a “gift” that they then can hone and further develop. Our secret to throwing gatherings of twenty to thirty is to make them pot luck dinners or bring “an hors d’oeuvre to share.” There’s always plenty of food. Such “community” get-togethers don’t overwhelm us with party planning details and people seem to appreciate having a place to meet. Volunteering at York Hospital has been one of the highlights of my retired life. I round (i.e., I go around to patient rooms to see how we as a hospital are taking care of them.) and am on two committees dealing with improving patient and family experiences at YH. Today I was on the YH campus to participate in a mattress comparison. The hospital is upgrading their mattresses and, as they often do, they value input from community members who are not healthcare or medical professionals. My gift today is to some unknown driver who doesn’t get a punctured tire. As I pull up the driveway into the hospital lot, there is a big ole eight inch triangle of a rock that has fallen into the path of oncoming cars from the nearby stone wall. Steering left, I see it in time to avoid it. I figure someone more stressed than I might be hurrying to see a loved one at YH and might just roll right over it. I park my Hyundai Elantra and walk back to place the rock in the stone wall. As with so many gifts, it is I who gets the joy and happiness by fully participating in the giving life.